Spring has officially arrived in my world. Get your events booked in advance. Summer is right around the corner. Get your reservations before it’s too late. 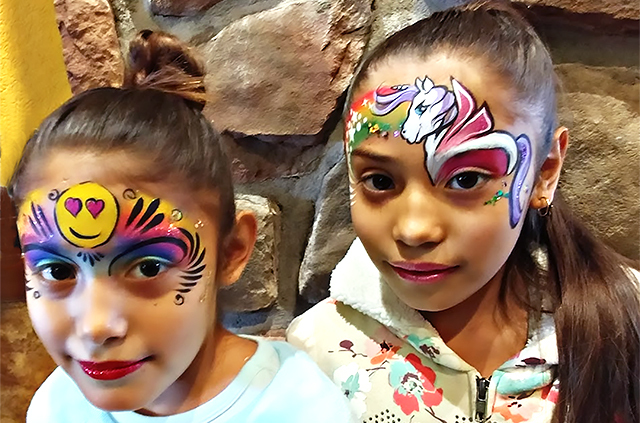 Rainbow Faces offers professional, reliable face painting in the Cincinnati, Ohio area at reasonable prices. For the past thirteen years we have painted at birthday parties and other family events as well as corporate events and major festivals. Whatever the size of your event you will be delighted with our services, tailored to your group or theme. In addition to talented and friendly face painters we also have balloon twisting available. Browse our recent events for samples of our work and get in touch to see if your date is available. See the smiles as our artists bring your child’s dreams to life. Make your next party one where tigers and princesses and butterflies and superheroes join together in unlimited fun. We have held the line on rising prices. Book a face painter for only $75/hour (2 hour minimum). We’re on Facebook. Click here to visit us there.